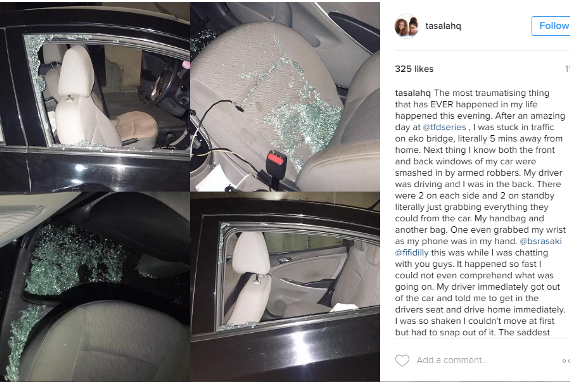 The CEO of TasalaHQ salon, Dupe Talabi expressed her ordeal with robbers on Instagram. She was robbed on Eko Bridge yesterday night by six men. Read what she wrote after the cut..
"The most traumatising thing that has EVER happened in my life happened this evening. After an amazing day at @tfdseries , I was stuck in traffic on eko bridge, literally 5 mins away from home. Next thing I know both the front and back windows of my car were smashed in by armed robbers. My driver was driving and I was in the back. There were 2 on each side and 2 on standby literally just grabbing everything they could from the car. My handbag and another bag. One even grabbed my wrist as my phone was in my hand. @bsrasaki@fifidilly this was while I was chatting with you guys. It happened so fast I could not even comprehend what was going on. My driver immediately got out of the car and told me to get in the drivers seat and drive home immediately. I was so shaken I couldn't move at first but had to snap out of it. The saddest part is that no one tried to help as my driver attempted to hold one of them down. There were so many cars and people on the road but everyone just looked on. I thank God that we are both safe, alive and well. Everything that was lost was material and the car can be fixed. I've heard these stories before but in my 4 years of living in Nigeria, this was a first for me. Apparently these things happen more during the festive season. Please let us all be extra careful and vigilant. These are hard times in Nigeria and people are desperate. Keep safe!! I'm just super grateful to God that we were not physically harmed. The thieves can enjoy rocking my handbag and my possessions for all I care 😔 #staysafe#Nigeria"